It is a quarterly journal that analyzes the issues of Micro, Macro, Development and Energy economics. It provides papers on Industrial economics, Public finance, Industry, Agricultural, Rural economics, etc. 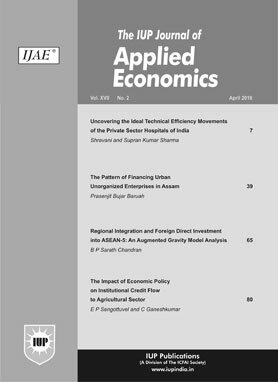 Financial Innovation and Stability of Money Demand Function in India: Do Equity Derivatives Matter? This paper examines the relationship between the USD/INR implied volatility and future realized volatility by using non-overlapping monthly volatility data from April 2005 to March 2017. The empirical results suggest that the USD/INR implied volatility is biased, yet a better predictor of future realized volatility of the exchange rate than historical volatility and GARCH forecast. The out-of-sample forecast also shows that implied volatility outperforms both historical volatility and GARCH forecast in predicting future realized volatility. The implied volatility is found to be an efficient predictor vis-Ã -vis historical volatility as it subsumes all the information content of the historical volatility about future realized volatility. However, the GARCH forecast contains some incremental information about future realized volatility beyond the information contained in the implied volatility, though the predictive power of implied volatility remains higher than the GARCH forecast. This paper revisits the issue of money demand stability in the Indian context by using some variables capturing financial innovation such as equity futures, equity options, and total equity derivatives in a set of money demand specifications. The ARDL bounds test approach to cointegration is employed and a long-run relationship is found in money demand models, including equity futures, equity options and total equity derivatives, in quarterly data spanning from 2001 to 2014. The coefficients of all the derivative variables bear positive signs, indicating the presence of wealth effect. The present study examines the Overall Technical Efficiency (OTE), Pure Technical Efficiency (PTE) and Scale Efficiency (SE) of six sample companiesâ€”Bharat Petroleum Corporation Ltd. (BPCL), Hindustan Petroleum Corporation Ltd. (HPCL), Indian Oil Corporation Ltd. (IOCL), Oil and Natural Gas Corporation of India Ltd. (ONGC), Oil India Limited (OIL) and Reliance Industries Ltd. (RIL)â€” selected from the oil and gas sector. These companies account for the major portion of Indiaâ€™s total oil and gas production. The data have been collected from the Prowess database and annual reports of the selected companies. The study covers a period of 27 years, i.e., from 1991 to 2017. The Data Envelopment Analysis (DEA)-based Window DEA Approach has been applied by conceptualizing one output and three inputs to analyze the technical and scale efficiency of the selected oil and gas companies. The empirical results show that the highest OTE, PTE and SE are recorded by ONGC and OIL, while the lowest OTE, PTE and SE are recorded by BPCL and HPCL. None of the companies is operating at most productive scale size. The inefficiency is attributed to managerial inefficiency and inappropriate choice of the scale size. The study highlights the need for concrete steps on the part of policy makers to choose the appropriate scale size and to eliminate managerial inefficiency. India, one of the emerging economies with huge demographic dividend, has been constantly facing the effects of natural disasters. Frequently, the devastating costs associated with natural disasters are considered as exogenous and outside the domain of mainstream economics. In a developing country like India with greater vulnerability, the exogeneity issue becomes more suspicious, and low economic performance at present may lead to occurrence of greater damage of future disasters. By employing ARDL model of cointegration, the study analyzes the decimate role played by natural disasters in short-run and long-run growth dynamics, thereby overcoming the problem of considering natural disasters as purely exogenous. The results indicate that natural disasters have a significant negative impact on GDP growth both in short run and long run in India. Similar retarding impact was found for per capita GDP growth which was taken as a robustness parameter. The natural negative effect is due to India being more prone to droughts and greater exposure and vulnerability of general masses to natural disasters.